What is the most effective way to control dandelions in your lawn and garden? This issue is top of mind in spring when these prolific golden weeds come into bloom. The standard remedy has been herbicides, specifically products with 2,4-D such as Killex spray or granular Weed and Feed. The trouble is that most people use these products in the spring when dandelions are blooming, but the weeds often survive this early season application. Many studies have shown that the best time to crack down on dandelions with a 2,4-D-based herbicide is in the fall. But this message doesn’t seem to get through. If applied in fall, this herbicide is much more effective, and it kills off both the mature plants and the young ones that grew from all those seeds that blew around in the spring. A product called Sarritor is commercially available in Canada to control dandelions. This is a biological control agent, a fungus that selectively kills broadleaved weeds, but not your lawn grass. Find out more about Sarritor and Fiesta, another alternative herbicide, this one based on a chelated iron formulation. These products appear promising, and both were introduced into the North American market in 2010. How to control dandelions – alternatives to herbicides? 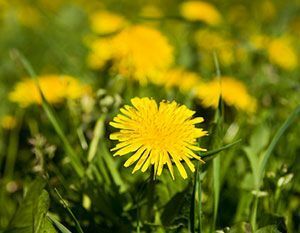 In Canada, many cities and municipalities and provinces, including Ontario and Quebec have banned the lawn chemicals that are effective against dandelions. In the US, activists are working towards similar bans, so you may have no choice about learning to use other methods of control. Some of the following alternatives are more effective and more practical than others, and, of course, everything depends on the size of your property. You can’t hand-weed acres. Hand-weeding: This alternative is very practical to control dandelions on small properties, and you can do it any time of year. The job is easier to do after a rain or lawn watering when the soil is moist. The tool you need is a weeding knife , which you insert alongside the dandelion root. Rotate or pry the knife to loosen the root so you can easily pull the entire dandelion plant out, roots and all. This works well in flower beds. There are also a number of weeders on the market with long handles that you can use for dandelions in the lawn without stooping. Vinegar herbicides: Acetic acid or vinegar concentrations which are stronger than household vinegar can be used as natural weed killers to dehydrate and weaken plants. The downside is that vinegar may not kill dandelions with just one application, and must be sprayed only on the plants you want to kill. If you spray it all over your lawn, you will damage the grass. Propane weeding torch: This tool burns off the top of the plant, but usually needs more than one application to be successful with tough plants like dandelions. Generally it doesn’t kill off the root, which means the plant can re-grow. Corn gluten meal: This is a natural product that prevents germination of weed seeds, including crabgrass and dandelions. It is not effective with established dandelions, but it will slow down and prevent germination of new ones. Turf grass researchers have found that consistent use of corn gluten meal over a number of seasons greatly reduces lawn weed populations. Corn gluten is also a fertilizer containing 8 to 10 percent nitrogen, which means that it also helps keep turfgrass thick and vigorous so weeds can’t easily get a foothold. Apply corn gluten in early spring about the time that forsythia and daffodils are in bloom. One caution: this product will prevent grass seed from germinating, so don’t use it if you are overseeding or putting down grass seed. Mowing: Never scalp your lawn. For fewer weed problems, set your mower high, to at least 3 inches or 3 ½ inches.